Arizona actress Ivy Meadows is performing in “The Sound of Cabaret,” a mash-up of “The Sound of Music” and “Cabaret,” at the same time that she’s learning to be a private investigator. When an accidental fire leaves her without a place ti live temporarily, Ivy’s cast mate gives her the chance to house-sit for a neighbor who will be travelling abroad. But Ivy’s stay gets off on a horrible step – she finds a dead man. At first, Ivy is doubtful of the death being suspicious, but the man’s daughter insists that her father would never take his own life. As Ivy digs deeper, more deaths are looking more and more suspicious – there seem to be an awful lot of suicides in this one senior community. In The Sound of Murder, Ivy juggles her investigation with rehearsals, a budding romance, and an off-putting cast mate claiming to want to be her mentor. Cindy Brown writes with wit, humor, and engrossing narrative ability. The story is magnetic – it pulls you in and makes you want to keep reading until, like Ivy, you can unmask the killer. Thoroughly enjoyable and a wonderful follow-up to Macdeath. I can’t wait to see what’s next! All Ivy Meadows wants is to be an actor. And a private investigator. Plus she’d really like a pair of clean underwear, a place to stay since her apartment burned up, and to overcome her fear of singing in public. Also, she’d really like to knock the socks off the big New York producer who’s coming to Arizona to see her in the world premiere of The Sound of Cabaret—featuring singing nuns and Berlin burlesque—at Desert Magic Dinner Theater. Ivy’s cast mates come through with singing lessons, a pair of granny pants, and a housesitting gig in a retirement community. And her P.I. uncle even assigns her a real case. But all is not raindrops on roses. During her investigation, Ivy clashes with the local posse, stumbles upon a firebug and a snoring pug, and finds herself smack in the sights of a serial senior-killer. 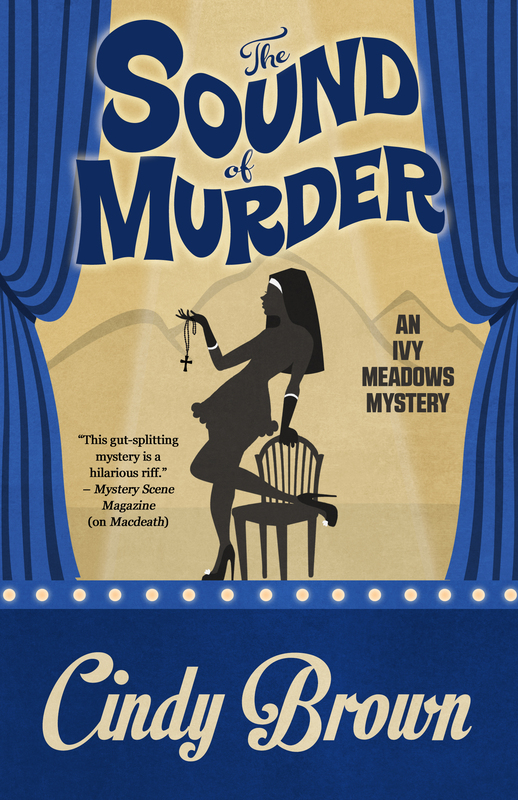 Click here to enter to win a print copy of The Sound of Murder!